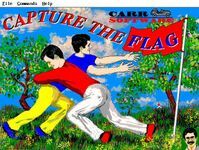 Capture the Flag is a simulation of the classic field game for DOS and Windows. Two teams face off across a wide landscape of varied terrain. Each team selects or creates team members with different attributes; some characters are faster, some are better at capturing others, some are more stealthy, and so on. Each team sends players across the middle line in search of the flag. The team that returns the other team's flag first, wins!